You also can find it at your local bookstore. The Johnsons—mother, father, and two daughters—were a loving, and close Seattle family. Then the younger daughter Linea started experiencing crippling bouts of suicidal depression. Multiple trips to the psych ward resulted in a diagnosis of bipolar disorder, and it took many trial runs of drugs and ultimately electroshock therapy to bring Linea back. But her family never gave up on her. And Linea never stopped trying to find her way back to them. 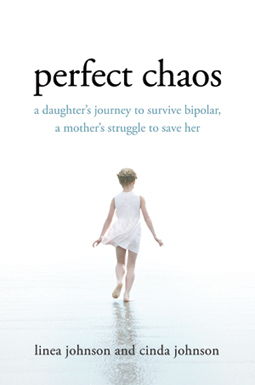 Perfect Chaos is the story of a mother’s and daughter’s journey through mental illness towards hope. From initial worrying symptoms to long sleepless nights to cross country flights and the slow understanding and rebuilding of trust, Perfect Chaos tells Linea’s and Cinda’s harrowing and inspiring story, of an illness that they conquer together every day. It is the story of a daughter’s courage, a mother’s faith, and the love that carried them through the darkest times. Progress and updates on Perfect Chaos will be shared here.